ASHP (American Society of Health-System Pharmacists) today released five recommendations to facilitate optimal medication use for patients in acute and ambulatory care settings as part of the Choosing Wisely campaign. Choosing Wisely is an initiative led by the ABIM Foundation and Consumer Reports to reduce waste in the healthcare system and avoid risks associated with unnecessary treatment. Nearly 80 national medical specialty societies have contributed recommendations to promote clinician and patient conversations about appropriate care. ASHP is the first and only pharmacy organization to participate in the campaign. Do not initiate medications to treat symptoms, adverse events, or side effects without determining if an existing therapy or lack of adherence is the cause, and whether a dosage reduction, discontinuation of a medication, or another medication is warranted. Do not prescribe medications for patients on five or more medications, or continue medications indefinitely, without a comprehensive review of their existing medications, including over-the-counter medications and dietary supplements, to determine whether any of the medications or supplements should or can be discontinued. Do not continue medications based solely on the medication history unless the history has been verified with the patient by a medication-use expert and the need for continued therapy has been established. Do not prescribe patients medications at discharge that they were on prior to admission without verifying that these medications are still needed and that the discharge medications will not result in duplication, drug interactions, or adverse events. Do not prescribe or administer oral liquid medications using teaspoon or tablespoon for measurement; use only milliliters (mL) when measuring with an approved dosing device (e.g., medication cup or oral syringe). Consumer Reports works with the ABIM Foundation, medical specialty societies, and consumer and advocacy partners to create and distribute patient-friendly Choosing Wisely resources for consumers and physicians to engage in these important conversations. These efforts reach millions of patients across the country. ASHP will work with Consumer Reports to develop patient resources to support the campaign. To learn more about Choosing Wisely and to view additional details about ASHP’s recommendations and the evidence supporting them, visit www.ChoosingWisely.org. ASHP represents pharmacists who serve as patient care providers in acute and ambulatory settings. The organization’s more than 43,000 members include pharmacists, student pharmacists, and pharmacy technicians. For 75 years, ASHP has been at the forefront of efforts to improve medication use and enhance patient safety. For more information about the wide array of ASHP activities and the many ways in which pharmacists advance healthcare, visit ASHP’s website, www.ashp.org, or its consumer website, www.SafeMedication.com. 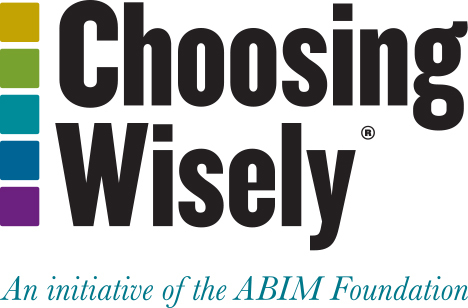 First announced in December 2011, Choosing Wisely is part of a multi-year effort led by the ABIM Foundation to support and engage physicians in being better stewards of finite health care resources. Participating specialty societies are working with the ABIM Foundation and Consumer Reports to share the lists widely with their members and convene discussions about the physician’s role in helping patients make wise choices.